Moze Radio (RIP) during the interview last year. His body is dressed in military regalia. 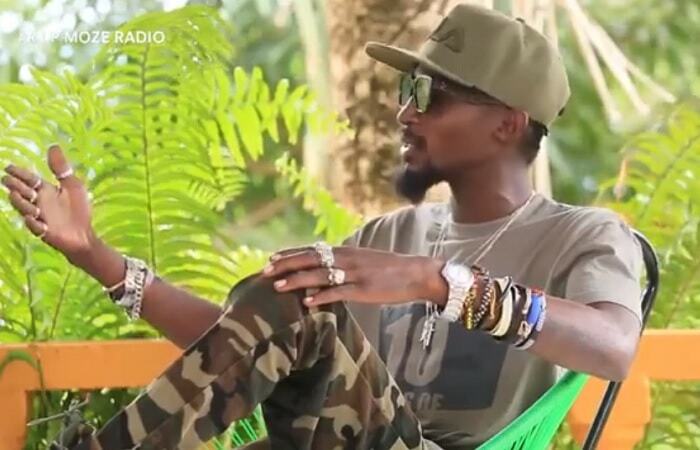 This interview was held in November last year as Radio and Weasel were combing various media houses ahead of their concert to mark 10 years of RAW (Radio and Weasel). I'm a Ugandan and African, born and raised in Jinja, then I grew up in Mbiko and some parts of Mafubira. My mom was a food vendor and my dad a truck driver, we are six and one passed on, he was the second born. He studied from Alliance nursery school and crossed to Njeru primary school. He also noted that he went to various primary schools as they used to move from location to location. Lake View Senior Secondary School, then went to Kiira College Butiiki. I started singing way back and every time we had visitors at home, my mom could tell me to sing for the visitors, little did I know I was practicing for the job. When I was done with S.6, I came to Kampala. My mom came to Kampala and she was in Kibuye still vending food. I joined university and was pursuing community psychology. I met Chagga at a barber shop where he used to come for a hair cut and I could sing, he saw talent in me and introduced me to Chameleone. Chameleone helped kick start my business. 'Jenipher' was my first song. 'Nakudata' was a gospel song that Omulangira Ssuna was working on, but when we got on board, we changed things. We left Chameleone in 2007...Continue with the interview.